Whether you are an expert home brewer, own a company brewing beer, or own a vineyard, a quality beer brewing or wine making microscope can make your job much easier. Here are a few things to look for when selecting a microscope. You will need magnification in the 400x to 1000x range in order to view cells, bacteria and yeast. If you simply want to count cells, a basic binocular compound microscope such as the basic beer and wine microscope with 400x magnification can do the trick. Make sure you have coarse and fine focusing! The fine focus adjustment is important, especially when using the microscope at the higher magnifications. Get a microscope with a mechanical stage. The mechanical stage will allow you to maneuver your slide in small increments and without frustration. 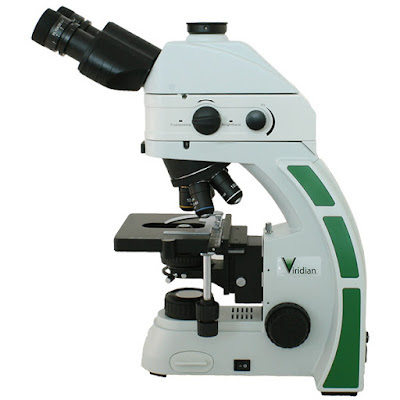 A monocular (single eyepiece) microscope will suffice, although if you spend much time looking through the microscope binocular (two eyepieces) will be much more comfortable. Don't use a microscope with a disc diaphragm - an iris diaphragm on the condenser will allow you to enhance the contrast in your image when you close down the diaphragm. Phase contrast is the best technique for looking at both yeast and bacteria. Phase contrast microscopes vary from simple phase contrast (usually only 40x phase objective) to full phase contrast which provides phase contrast 4x, 10x, 40x, 100x objectives. Phase contrast will allow you to view enhanced images of both yeast and bacteria. Cell counting can be performed with a grid eyepiece reticle or with measurement software included with the microscope digital camera. A hemocytometer is used for counting. The Brewing Science Institute has some great educational info here. When viewing yeast through the microscope you will use the 40x lens (400x total magnification). Notice whether the cells are bacilli (rod shaped) or cocci (round shaped). Phase contrast will allow you to view yeast or bacteria that is often the same color as the background it is against. Beer and wine microscopes vary from basic phase contrast and digital basic phase contrast to more advanced full phase contrast microscopes or even an advanced fluorescence beer/wine microscope in order to perform live-dead tests. Here are a few tasks every vintner should be able to perform with a microscope. Distinguish between bacteria, yeast and fungi under the microscope. Identify and differentiate living organisms from plant debris, filter agents or crystals. Identify the most common organisms by sight in order to take action quickly if needed - including wine yeast, mold and bacteria. Phase contrast microscopes are helpful when viewing bacteria and yeast. Count yeast cells and distinguish between living and dead cells. The easiest way to differentiate bacteria, yeast and mold is by size. Molds are easy to view at 100x magnification, yeast at 400x, and bacteria at 400x or 1000x. Determining if cells are living or dead is best performed by looking at symmetry. Debris tends to be asymmetric, while living organisms are symmetric. View more wine making microscope tips here.